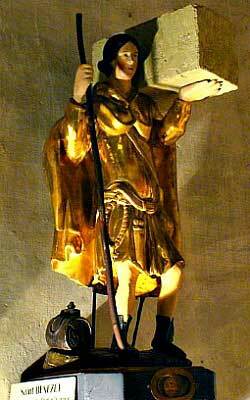 Bénézet or “Little Benedict” was a French lad, pious and thoughtful beyond his years who minded his mother’s sheep. He was deeply concerned about how dangerous it was for poor people to cross the unpredictable Rhône River. 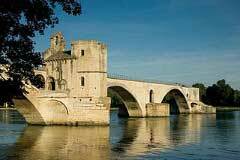 It is said that during an eclipse, in the year 1177, he heard a voice that said to him: "Bénézet, take your rod and go down to Avignon, the capital's waterfront: talk to people and tell them that we must build a bridge." In the Middle Ages the construction and repair of bridges was considered a work of mercy. Though Bénézet knew nothing of building bridges, he took his staff and obeyed the call. At first the bishop of Avignon dismissed him as being daft, but after witnessing several miracles performed by the holy shepherd lad, he supported the enterprise, and the Brotherhood of Bridge Builders was formed with wealthy sponsors. For seven years Bénézet conducted the operations. Bénézet’s body was interred in a small chapel on the bridge itself. This chapel, standing on one of the bridge's piers, was dedicated to St. Nicholas, the patron saint of the Rhône boatmen. In 1669, when part of the bridge collapsed from the force of the current, his coffin was taken up and in 1670 opened before the Grand Vicar. The body was found to be intact, even the bowels were sound and the color of his eyes fresh. The body was first translated to the Cathedral of Avignon and finally interred in the Church of St. Didier in the city. 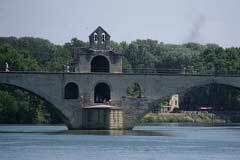 The fame of Bénézet's bridge in Avignon was spread far beyond the borders of France by the children’s song, Sur le Pont d’Avignon, which is sung all over the world, even in China.